Edwin Parker Twombly, nicknamed Cy by his father, is an American modern artist. He was born in 1928 in Lexington (Virginia). He became interested in arts at a very young age. He studied among other things in the well-known Black Mountain College (North Carolina). Later on he moved to Italy, where he married in 1959 the Italian Baroness Tatiana Franchetti. 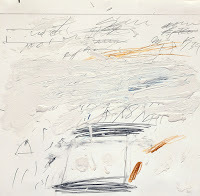 The triumph of Twombly’s career is due to his ability to take historical subjects and reinvigorate them with new, outdoor life and energy, using a freely scrawled and calligraphic-style, and with a dominance of grey and white colors. 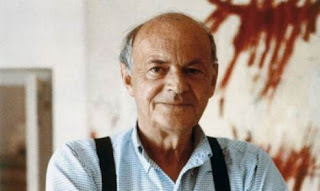 Cy Twombly died on 5th July 2011 in Rome, losing a long battle to cancer. One of his most famous paintings is Poems to the Sea (1959). This is a set of 24 different works. These use different painting techniques such as oil, pencil and wax crayon on paper. The series has also been published as a book in 1990. 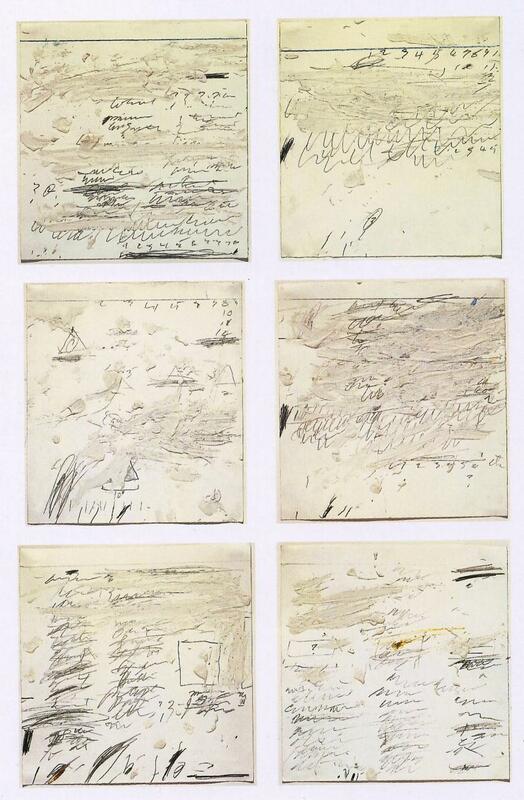 Twombly seemed to be fascinated by the classical antiquity and the idea of timelessness. But first, it is worth to focus on one particular technique: aphorism. The aphorism is nowadays very present in the modernists’ paintings. It consists of isolated sentences or phrases separated by blanks, crossing-outs and careless drawings. The term aphorism also designates the horizontal of all skylines. It represents a fragmented world which seems meaningless. 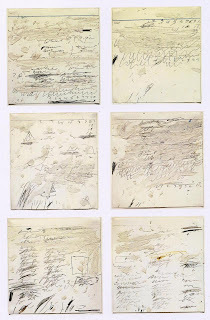 All these aspects of the aphoristic technique are present in Twombly’s Poems to the Sea. As already mentioned, we can find traces of the Greek mythology, philosophy and the idea of the timelessness in the painting. The presence of certain words, such as Time, could be explained by the ancient Greek philosopher Heraclitus and his theory of Πάντα ῥεῖ (panta rhei) "everything flows". The basic idea of this philosophy is to understand the concept of time as an inherent phenomenon even though it seems to be constantly in movement (the timelessness). Another well-known piece of work is Four Seasons (1993-1994). There are two variants of these series of paintings. Four paintings have been on view at Tate Modern (London) in 2008, the four others are exhibited at the Museum of Modern Art in New York. They represent as their name suggest the four seasons, and show the Mediterranean region. They are full of symbolism: they are images of the time passing, of the countryside changing, and they show a cyclical view of life. But they also refer to culture and history, from Ancient Greek and Roman Time, to the present day. Other important elements are the text and poems present on the canvases. The painting Springs has a red and yellow dominance. It represents Egyptian boats, carrying deaths after life. On the canvas Summer we can see the bright light and the heat of Italy, but also a poem by George Seferis, a Greek poet. The next season, Autumn shows a scene of grape harvest. This has been the first canvas he painted in the series Four Seasons. The last season, and last painting is Winter where there is a lot of grey and white, symbolizing snow covering the writings. Even if Twombly’s work has been criticized many times, the MoMA supported the artist by saying ‘’No, your kid could not do this‘’. 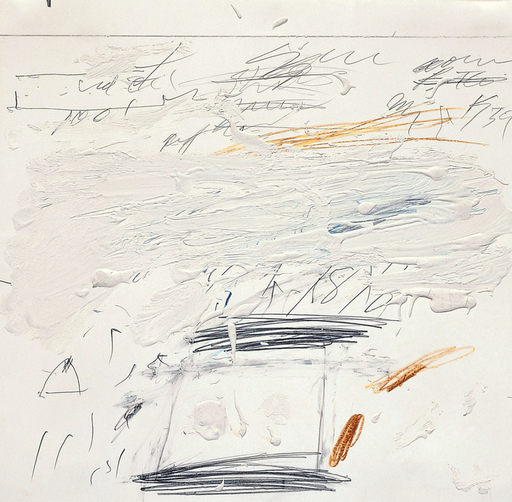 Cy Twombly said himself ‘’My style is childlike but not childish‘’ and explained ‘’What I’m trying to establish is that modern art isn’t dislocated, but something with roots, traditions, and continuity. For myself the past is the source‘’.